These are some of the budget spin bikes that come under 500 dollars. In this post, let us look at some of the best spin bikes you can buy under $500 for working out in your home. The spin bikes are the most used type of exercise bikes that you typically see in the gym and strength training centers. However, they are also well suited for home use. 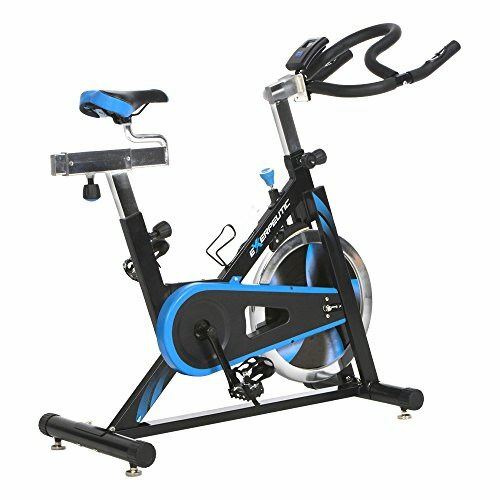 We researched a lot of spin bikes under the cost of 500 dollars, we found that the Sunny Health & Fitness Belt Drive Bike is the best for most of the people. In the recent years, spinning has gained a wide popularity due to their wide benefits than other cycling techniques. In fact, there are spinning classes arranged in some of the gyms for increasing cardiovascular endurance. I’ve researched some of the best spin bikes that are loved by many of the fitness enthusiasts and are a perfect value for money. There are other bike types like upright exercise bikes. The spin bikes involve the usage of a big steel flywheel that revolves when you pedal. There are some of the excellent reasons to choose the spin bikes over any other bikes. Spin bikes are suitable for light to power workouts. Whereas, the upright bikes are only suitable for light workouts. Spin bikes burn calories much faster than any other bikes. On average it burns at the speed of 500 calories per 45 minutes of spinning. That’s great! Isn’t it? Spin bikes simulate the uphill cycling and sprinting experience at the comfort of your home. Meaning, you’ll get all the benefits of uphill cycling by just increasing the flywheel resistance and spinning while standing up on the pedal. 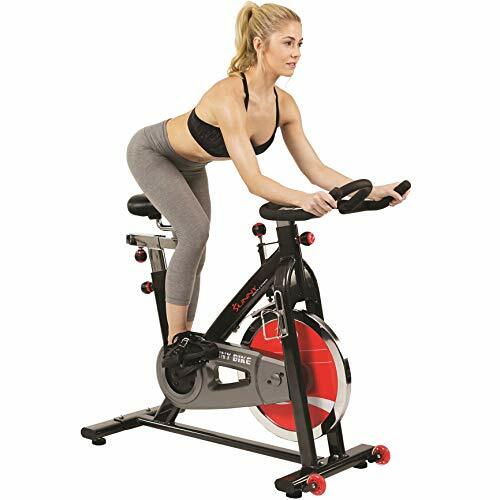 Spin bikes would greatly exercise the calf muscles, and also the abdomen as you stand up or lean forward while spinning. Spin bikes are professional and good looking. No matter for what reason you may be buying exercise bikes, there’s no big reason for you to go for upright bikes other than spin bikes. Flywheel weight: As you may already know, these spin bikes come with flywheels to simulate the real bicycle-riding experience. The flywheel comes with weights of 30-50lbs. The larger flywheels require much effort to drive and this suitable for strength training and other workouts. But for most of the types of workouts, the suggested flywheel weight is 30lbs. Resistance mechanism: When you tighten the resistance knob, there are two ways in which the bike offers resistance to the spinning. In mechanical resistance, the rubber pads rub the flywheel; it’s noisy and causes wear and tear on the pads. Whereas in magnetic resistance mechanism, the magnets suspend at the two sides of the flywheel and will be moved closer when you tighten the knob, thus offering resistance to your spinning. This is a non-destructive and silent way to provide resistance to the spinning. However, most of the spin bikes under $500 come with mechanical resistance. The magnetic resistance only comes with high-end bikes. Drive: There are two ways by which the pedals are attached to the flywheel. One is the chain and another is the belt mechanism. The chain mechanism is what you see in traditional bikes where the chain is used to drive the wheel. But similar to that of on-road bikes, chains require lubrication and maintenance. The another method is belt drive. Most of the good spin bikes come with Kevlar belts, which require no maintenance. The Kevlar belt is more durable than other mediocre rubber belts. However, after years of use you just need to replace the belt. Adjustments: When it comes to seat adjustments, the seat can be adjusted in 4 ways – up, down, and sideways. Whereas, in most of the times, the up and down adjustments of the seat is enough. The handlebar height can also be adjusted in most of the best spin bikes. This comes handy if you are doing spinning while standing or leaning front to hit the right muscles. If multiple people use the bike, then adjustment of both the seat and handlebar are essential so as to suit their differing heights. Transport wheels: The spin bikes are heavy for a reason- the flywheel and the steel construction. Transporting the bike will be difficult. So to solve this issue, the spin bikes should come with two transport wheels in the front so that you can move the bike comfortably. This is our top pick mainly for the reason that this bike comes with the heaviest flywheel in this range, 50 lbs. Due to the heavy flywheel, the bike gives you a real driving experience. The bike remains super-sturdy even when you are riding this while standing. The flywheel turns smoothly due to the weight of the wheel. It’s a bike with no fancy features like trackers and mp3 players. It’s meant to be made sturdy and solid for fitness enthusiasts who believe in their workouts and cut the crap. The bike is run by the belt mechanism. This makes the bike to run smoothly without making any noise like that of the chain drive. This belt mechanism gets you rid of maintenance for the bike. As I told you earlier, with these you just need to replace the belt once a year or two depending on your use without any maintenance at all. The resistance of the bike is mechanical. You can’t expect the bike to have magnetic resistance in this range under $500. This friction resistance makes the bike to produce a little noise when riding with high resistance. However, this can be fixed by getting a silicone spray. The pads need to be replaced every 7 months or so depending upon your workout intensity. The pedals of the bike are solid and screwed tightly to the crankshaft. The pedals come with toe cups, that’s great while doing intense workouts. Some may find the cup to be tight, in this case, you can always replace the pedals of your choice. The Q-factor in this bike is small. If you don’t know what is Q-factor, it refers to the distance between the distance between the pedal attachment points to the crank arm. The shorter this distance is, the better it is. It helps your knees to pedal in a streamlined direction and avoid injuries. The Q factor of the bike is 7.5 inches which is great but if you want a bike with still low Q-factor you can go for SF-B901. The bike also includes a bottle holder at the right side, which is a great addition if you use a water bottle to stay hydrated during intense workout sessions. This is the only accessory that this bike comes with. While the adjustments of the seat and handlebar are fairly straightforward, if you are too tall like above 6ft, then you may find the handlebar as low while leaning front and riding. In this regard, the bike’s handlebar could be designed higher. The bike is built solidly. You can easily stand and also crazily jump over the saddle without any wobbliness. The bike comes with 40 lb flywheel, which does a good job of offering smooth spinning experience. The frame is super-sturdy in Bladez Fitness Fusion GS II when compared to the previous version. It’s oversized and made extremely durable. The pedals come with baskets inside which you can slide your shoes, like most of the spin bikes. This feature helps you easily stand while spinning or keep your legs intact while spinning fast! You can move both the handlebars and the seat vertically and horizontally using the adjustment poles. The adjustment of the handlebar makes it incredibly easy for you to do various types of spin workouts. This prevents you from straining your body due to improper posture. It also will be very helpful in case you share the bike with other people. The resistance is one of the important options to get in a spin bike. The knob at the top of the frame allows you to change the resistance of the bike incrementally. The incremental adjustment of the resistance allows you to do the precision workouts. The resistance mechanism is mechanical. This means that you’ll hear a slight noise when the pads rub the flywheel, especially when spinning at higher resistance. It also comes with another downside i.e. as there are no fixed resistance levels, you can’t do the workouts the exact same levels everytime if you wish to do so. Like most of the spin bikes, some people find the seat of this bike uncomfortable. However, as always you can opt for another seat or a gel cover to fix minor inconvenience. 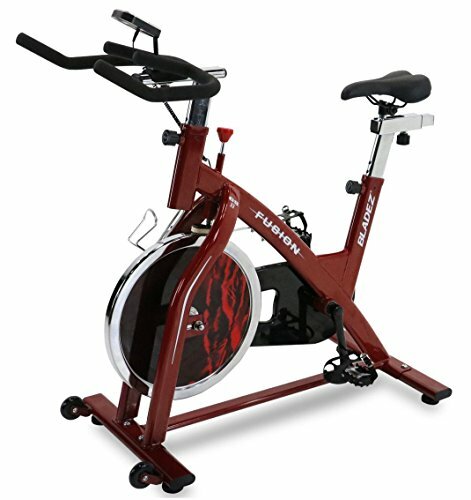 This is the best spin bike under $500 that comes with LCD display and also the heart rate monitor. If you are looking to stay motivated by tracking the calories you burnt while working out, this bike is for you. This bike has 40 lbs flywheel, that makes your spinning smooth and sturdy. This flywheel is driven by a chain, that’s bit noisy when combined with high resistance. The bike can handle cyclists who are up to 300 lbs, which is quite impressive for larger cyclists looking to get a good workout out of the bike. The height of the seat, seat angle, seat horizontal position, and also the handlebar can be easily adjusted. This is great! With these adjustments, the tall people can also be easily accustomed to riding this bike. Some may find the handlebar little far, and the downside is that there is no mechanism to adjust the closeness of the handlebar. The resistance is mechanical, which works with the help of pads that rub against the flywheel. The resistance pads need to be replaced every 6 months or so, and the pads are available on the company website or Amazon. The pedals and the crankshafts are strong enough to withhold the pressure caused during hill climbing or while standing and driving. There are baskets on the pedals to slide your shoes in, and these lack an adjustable strap which may be a quite downside for some people. The great thing is that the pedals in this bike is adjustable. You can even swap in the clip type of pedals suitable for cycling shoes. The LCD computerized display does a good job of displaying distance, calories burned, elapsed time, speed and pulse monitoring. Monitoring your heart rate is very important to ensure that you never exceed that target zone set by the machine. This avoids injuries and heartburns. Transporting wheels are also included in order to make the moving easier. The bike comes with a 40 lbs flywheel. This heavy flywheel offers you the experience of riding an on-road bike and is very smooth. The resistance mechanism is mechanical. As you tighten the knob, the break pads do a good job of offering resistance in your workout for your cardio training. But the downside is that, as the resistance mechanism is mechanical, it does make some noise. When it comes to adjustability, you can adjust both the seat and the handlebars. The right posture while spinning is very important, so the adjustability feature of this bike is something worth to note. The bike is driven by chain mechanism. The chain tends to make some noise. In the case of any issues, you can always replace them with any bike chain. The seat is comfortable. But it is a fact that no single seat is comfortable for everyone. If you are fat, you may find hard getting used to these conventional bikes. In that case, you can replace the stock paddle with a seat that is wide with thick padding. The one downside of this bike is the lack of any computerized functions. Neither you can track the time nor you can track the calories you’ve burnt. The seat is padded and is quite uncomfortable for some fat people like any other spin bikes. However, this can be solved using a gel cover. This bike comes with a 40 lbs flywheel which is more balanced and sturdy than most of the flywheel bikes that come with 25 lbs or 30 lbs. The riding experience will be great with this heavy flywheel. Even when you stand up and spin, the bike does its job very well by not shaking a bit. The seat height is adjustable 4-ways, along with the seat height adjustment, you can also adjust the nearness of the seat to the handlebar. Whereas, the handlebar is not adjustable. However, the height of the handlebar is just right. Some very tall people may feel the need of adjustable handlebar. Keep this in mind. As usual, there’s a tightness knob which provides you resistance if needed. You can tighten the knob to an extent that you can hardly pedal. The friction is mechanical, which is to be expected in this range. Even though the resistance is mechanical, the bike is silent while spinning. Sometimes, the system makes squeaky noises, so you need to do some lubrication to the flywheel part where the pads rub. But the downside of this mechanical resistance is that you need to replace the resistance pads every year or a two as it suffers more wear and tear. The seat of the bike is bit narrow, which is quite uncomfortable for fat people to spin. However, this can be easily solved by a gel cover or a wide seat bought separately. The transport wheel is included at the front for easiness, which is a nice addition. The bike comes with a easy brake system that allows you to stop the flywheel motion instantly without any hassles. Other than these all the things, the bike is well-built. It is absolute value-for-money. These are some of the good spin bikes under $500 that are worth it. Although the bikes I mentioned above do not come with advanced features like magnetic resistance and also workout training modes, these are the best value for the money. The above bikes can fulfill any spinner’s desire and can withstand good abuse.Hope you found the post helpful.